You are buying the First Quality Sleep Overs Youth Pants SM/MED 45-65lbs SLP05301 15/bag - Model #SLP05301 from First Quality. First Quality is a leading manufacturer of incontinence products including briefs, liners, underwear, diapers, and underpads. At ADW Diabetes, we do our best to offer the complete product line by First Quatliy with excellent pricing and fast shipping. First Quality Sleep Overs Youth Pants SM/MED 45-65lbs SLP05301 15/bag - are designed to meet the needs of children with the value and features moms love. Designed with Dri-Guard for leakage protection and available in a variety of options including refastenable sides, standard underwear style, and overnight protection. SleepOvers Youth Pants are designed to meet the needs of older children with nighttime incontinence episodes. 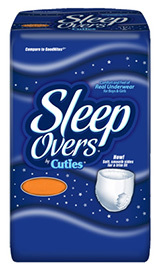 Super absorbent leakage protection keeps kids and beds dry. Unisex - Designed to fit both a girl and boy. Skin Smart Fabric - Hypoallergenic fabric that contains Aloe, Chamomile and Vitamin E for skin wellness. Stretch - Stretchy side panels are easy to grab, pull and attach for an adjustable fit that is secure and comfortable. Skin Smart - A combination of Aloe, Chamomile and Vitamin E that helps moisturize skin.